The architectural renderings were revealed for “The Broad” (a.k.a. 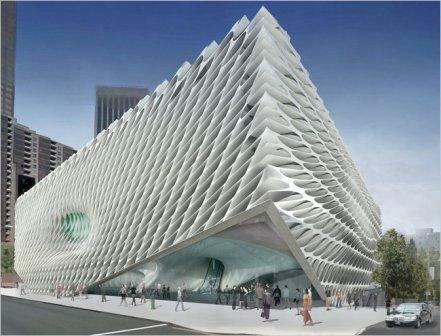 The Museum formerly known as “The Broad Collection”) in January and since then the plans have been on my mind. The new $130,000,000 museum will be housed adjacent to the Disney concert hall and the art community had been anxiously awaiting the final selection on the architect and the final design. Diller Scofidio + Renfro won the bid and the architects set out to design a space that will not compete with the iconic Frank Gehry designed Disney concert hall, but will aesthetically stand up to the concert hall’s striking exterior. The museum design features a honeycomb lattice exterior allowing natural light to filter into the gallery space. 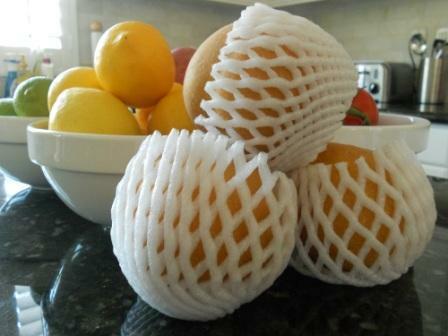 The opening will not take place until 2013, so until then I’ll just keep thinking about that honeycomb lattice. Where have I seen this before? What was the design inspiration? According to Diller, the firm used sponges and lava stones as their muse. For weeks, this design feature has intrigued and bothered me. It looks so familiar and I couldn’t put my finger on it. And then, recently I found the answer to this vexing problem right on my kitchen counter top. Lava stones? Sponges? No way, this museum is an Asian Pear! All jokes aside, there are some really interesting features to the museum’s interior that I can’t wait to see. Since Broad is partial to dramatic escalator entrances, the new museum will reportedly have an enclosed escalator taking visitors through the storage vault housing the works not curated in the museum or on loan to other institutions. It will offer an interesting behind the scenes glimpse of the collection for visitors. There are still many technical questions about this design and time will tell how they get tweaked between now and the 2013 opening, but for now, as I’m eating one of my Asian Pears, I take delight in my little countertop artistic discovery. Love this post…thanks for the update! Lots to look forward too in the LA art scene. I love your “still”, inspiration comes in many forms even a yummy piece of fruit! I didn’t know about this project and it looks fantastic and so futuristic! It will be a good reason for me to take the flight over to LA and check out the art scene there. Thanks! I’m really excited about this museum because Broad’s collection is incredible! Hope you all get a break from the snowstorms soon! The Asian Pears are brilliant. I wouldn’t put it past Diller and Scofidio to be inspired by this. They started as installation artists/Theoretical architects. First saw an installation of theirs at the Wexner back in 91. Thanks Mario, I’m still surprised at Broad’s decision to go with them given their limited work, but after seeing what they did with the ICA in Boston and hearing a bit more about their process, it’s clearer to me why he went with their firm. They have a fascinating approach to their work which clearly stems from their academic point of view. Wonderful comment Brenda, thanks for stopping by the site! Next Next post: “Love Me” was here: Happy Valentine’s Day!